CELEBRATE Hunky Days of Christmas! Jen Maddox is a few days into her summer study-abroad program and has loved every moment on her cruise ship turned college campus. Everyone tells her the experience will change her life, but none of them realize just how right they really are. One night, Jen goes out on deck and encounters five other students. She knows Charlie from one of her classes, and he’s a funny, friendly, regular guy. Picture-perfect Dani and his gorgeous wife, Mariana, live right down the hall from Jen, and she has seen TS, who’s built like a truck, around the ship, and recognizes the cute but quiet Thomas as well. Then Jen sees something that isn’t humanly possible. Jen would have thought that it was all a dream if not for the fact that Charlie, Dani, Mariana, TS, and Thomas are making every effort to cover it up. Suddenly, the five of them are everything but normal, and Jen is determined to figure out what they’re hiding. When she does, her life really does change. Jen expected to spend her summer studying the cultures of Latin America; she never dreamed she’d learn about a magical culture instead. But Jen’s childhood fantasy come true is about to turn into a nightmare; there’s something on the ship. Something dangerous. Suddenly, everyone on board is threatened by a creature that Jen never even believed existed. Jen and her new friends might be the only people who can stop it! Now Jen has to learn everything she can about her new world before it kills her. And her friends. And maybe everyone on the entire ship. 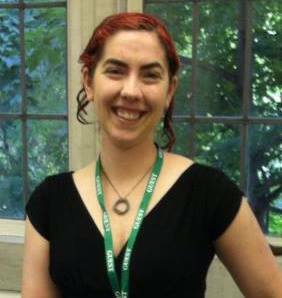 Elizabeth Kirke lives with her husband, two young sons, a hound-mix, and two turtles. She wanted to be an author before she even knew what an author was. She used to say that she wanted to be an artist, but that was only because she was too young to write and had to tell stories with pictures instead. She hasn't stopped writing since she learned how. It wasn't long before she dreamed of becoming an author and couldn't be happier now that that dream is a reality. If she isn't writing, she’s probably doing something involving books, baking, gardening, or yarn. Like most slightly-nosy, avid readers, Elizabeth can't resist trying to catch a peek at books she sees people reading when out in public to see if she can figure out what it is. While doing just that one day, she realized that it would probably be the coolest-thing-ever if she caught a complete stranger reading one of her books. That's her new dream. Since debuting her narration skills in 2009, Starla Huchton has lent her voice to many podcasts and audiobook productions. 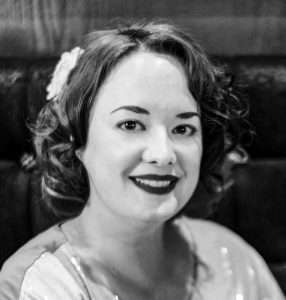 She has read both character parts and main narration for authors such as Tee Morris, Philippa Ballantine, and Lindsay Buroker, and her work spans across both fiction and non-fiction in multiple genres. Hurricane Florence did more than derail my end of summer clean-up, she killed my internet. Many apologies on that front. To battle the elements is a part of life that most humans just have to live with. Elizabeth Kirke takes the elements, makes them human and recrafts myth to weave a story that had my running to recharge my batteries to listen long past the time when I should head to bed. Semester Aboard's title intrigued me. As a self-confessed nerd who dearly loved her Semester Abroad studies, what could make them even more exciting but the thought of adding expansive travels on top of cultural immersion? Certainly that was what Jen Maddox signs up for at the urging of her step mom Rachel's insistence that her own Semester Aboard was "a life changing experience". Somehow, we get the idea fairly quickly that their experiences were vastly different as Jen is introduced into a world of Magics - where Vampires, Werewolves and Mermaids really exist and there are bad and scary things that have to be fought off to ensure the safety of humankind. Young Adult stories that have that "Scooby Gang" vibe as absolutely my favorites. I love the clash and play of characters, witty banter, crushes and epic action-adventure. To say that this story had some world-building issues is valid but there was a lot going on - lots of characters introduced very quickly and with more questions than answers for significant portions of the book. Once it started to gel, however, it was on fire - quite literally, as Jen chose fire for her first magic spells. The good guys were great friends who had each other's back and Ms. Kirke does a wonderful job separating them out into vignettes to allow dialogue to help build the story after the midway point which does much to elevate the pace and invest the reader more deeply in all the happenings. The bad guys are terrifying, with plot twists and surprises that had me actually pulling off the road while driving because I was so entranced in one action-packed fight scene. The semester does end and leaves the reader with a little let down, as all travelers have experienced when taking a grand adventure, because there is always a desire for "just a little bit more" but knowing that there is more out there is enough to sustain you until that time. Starla Huchton does an outstanding job narrating this novel - pulling out accents and keeping the story pace and flow moving quite nicely. There are readers that I find I need to speed up the narration on, particularly for stories over 10 hrs, but I kept this right en pointe as it was quite possibly perfect for the story just as it was. I will definitely be looking for her in additional listening opportunities. I received this audiobook as part of my participation in a blog tour with Audiobookworm Promotions. The tour is being sponsored by Elizabeth Kirke. The gifting of this audiobook did not affect my opinion of it. Never in a million years. When I originally wrote the book I was actually posting it, chapter by chapter, in the Original Works section of a fanfiction website! Back then, ebooks were hardly even a thing. Merely publishing Semester Aboard was a pipe dream and having an audiobook never even crossed my mind. I hardly even expected to be where I am now, with three (plus a short story collection) books in the series and three more on the way. 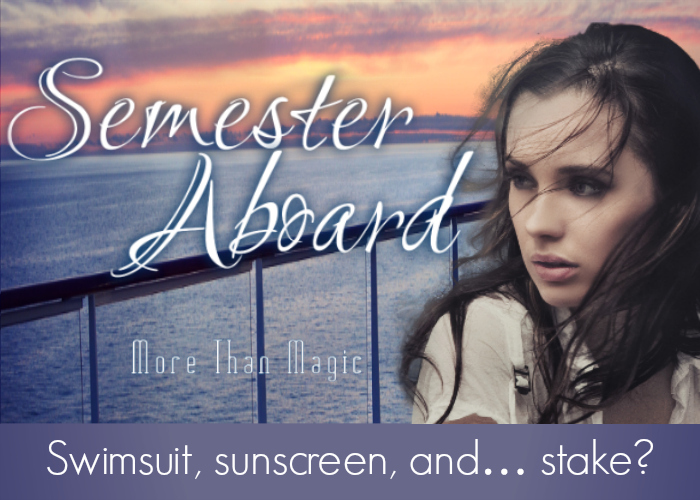 Not to mention having Semester Aboard win an award for Best YA Paranormal! Sheer luck! Starla and I were already Facebook friends thanks to the networking power of the author world. We actually sort-of worked together before, when she made a wand for me. (Actually, she made the top half of a wand to fit onto the bottom half of my existing one. The top broke off and I buried it with my beloved cat, but hated to have a broken wand just sitting around.) Anyway, I posted on Facebook asking my friends if they know any narrators and briefly described what I was looking for. Starla replied and sent a link to books she had already done. I knew she was the perfect fit right away, and the rest is history! How closely did you work with your narrator before and during the recording process? Did you give them any pronunciation tips or special insight into the characters? I gave Starla an absurdly detailed document with pronunciation, bios, and even descriptions and pictures. It was probably above and beyond what she needed, but since she brought it to life, it was worth it! We chatted back and forth a lot for the first couple of chapters, but after she had the characters down I just let her do her thing! Big yes! I was part of the Semester at Sea program back in college. I spent a summer on a cruise ship, operated (at the time) by the University of Virginia. I took college courses with UVA and visiting professors, while touring Latin America on the ship. I strongly encourage college students to do it! That experience inspired this book, in which the main character is a student in the same program. As she navigates magic and vampires, her voyage takes her to the same ports that I visited. While a lot more magic is thrown in, the characters do have many of the same experiences in different countries and on the ship that I did. In your opinion, what are the pros and cons of writing a stand-alone novel vs. writing a series? Interesting question. I think each pro and con play off each other. A con of plotting a series is that you need to plot out multiple books, and come up with character development and arcs that span more than one book. So, the pro of a stand-alone is that you can wrap it all up with a bow. However, it could also reverse! A con of a stand-alone is that you have to keep everything succinct enough to be contained in one book, but exciting enough to keep readers interested. Likewise, a pro of a series is that you can get really in-depth and intricate, and you have room to grow. I think it all depends on your strengths and weaknesses as a writer. I think it all benefits from Starla’s amazing performance. That said, I’ve gotten some negative feedback in the past regarding how slow some of the portions in the ports go. As you just read, they were based on my real experiences, so I think I got a bit too wordy and nostalgic as I describe them. But, Starla brings them to life and you really feel the excitement through the main character’s eyes as she reads. I think it really picks up the dragging parts. She also adds a wonderful sense of urgency to the fight scenes! If you had the power to time travel, would you use it? If yes, when and where would you go? I would head straight to 1797 and visit George Washington. I worked for several years as a historical interpreter on his estate and would love to pop in and see it in its prime. Not to mention catch some time alone with the General to talk to him. What do you say to those who view listening to audiobooks as “cheating” or as inferior to “real reading”? People say that!? Ugh, people will complain about anything for the sake of taking enjoyment away from someone else. 100% disagree. First, there are numerous medical reasons to listen to audiobooks, and that alone should be worth something. Vision impairment, arthritis, dyslexia…The list goes on. Heck, even a nasty migraine that makes opening your eyes torture, but you can’t fall asleep. And who doesn’t want to read a book while stuck in traffic? Why not listen? And, most importantly: people enjoy them. That should be enough. We should be rallying against people who want to censor or limit access to books, not people making them more accessible. Phew! The very next is Wrought-Iron Roses, the 2nd book in my paranormal romance series, The Curse Collectors. The first book opens with three sisters who inherit their aunt’s antique shop. Upon arrival, they discover that she was a rune-caster, and was in charge of breaking the curses cast upon all of the antiques in her shop. One of the sisters gets cursed, so they have to learn how to cast runes to save her. After that, I’m working on the fourth (fifth if you count Danio’s Prelude) book in the More than Magic series! I’m also hoping to get the audio for the next one lined up. Lastly, I’m working on the outline for a brand new series! This one is a paranormal cozy mystery series. I’m quite looking forward to writing it. 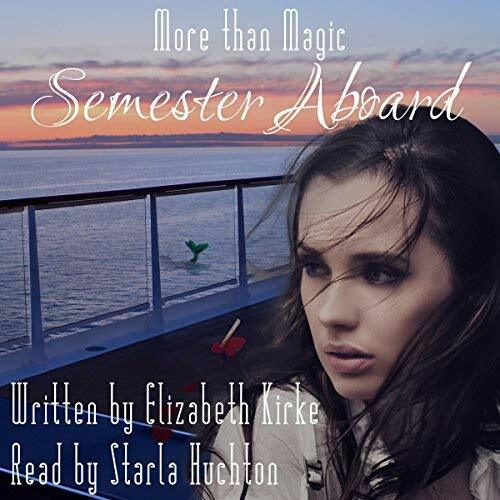 In this book: Jen thinks the only “magical” thing about her summer on a cruise will be the cruise itself, little does she know, some of her new friends are quite a bit more magical. In fact, they aren’t even human. Learning about magic seems like a dream to Jen, but it quickly turns into a nightmare; something is on the ship with them. Something dangerous. Now, the lives of Jen, her new friends, and everyone on the entire ship are threatened by a creature Jen never even believed existed. And it’s up to Jen to stop it. In this book: Taking time off for college is encouraged by MES, although Thomas and his friends are pushing the limits by signing up for a college cruise. Nevertheless, he’s ready for a fun summer of cruising and a three-month break from his job as the Resident Magic Coordinator with MES. In spite of all of his experience welcoming magical beings to town, he’s never seen anything like Jen. He’s never felt this way about anyone either. But, when a dangerous magic sneaks aboard the ship, Thomas knows it’s his duty as a Special Agent to stop it, and the lives of everyone on the ship may depend on what he can, or can’t, do. In this book: The only downsides to spending the summer on a ship, as far as TS is concerned, are his seasickness and monthly problem. A potion for the seasickness is easy enough. As for his other issue… well, he’ll just have to spend full moons in his cabin. Of course, it’s also annoying to speak seven languages and find yourself in a country that doesn’t speak any of them. For a Senior Field Agent, thinking on his toes is exactly what TS excels at. Handling a rogue magic on board should be a piece of cake. Of course, he’s also used to having back-up, weapons, and a wider field to work in. In this book: Prank-loving Dani was, naturally, the mastermind behind pulling some MES strings to get an all expenses paid vacation. The icing on the cake is being on a ship. Had he known the danger lurking, however, he would’ve taken a rain check. Dani’s no stranger to threats on his life, but he prefers to face them without the people he loves along for the ride. In this book: Mariana is eager to go along on a cruise with her friends, even if her bestie couldn’t make it. She’s ready for sun, sand, and (mostly) the depths of the ocean. There’s plenty of exploring to do with Dani by her side. But take her out of the water, and she’s not nearly experienced enough to take on the creature hunting them. Mariana feels more like a liability than a future MES agent. Nevertheless, she’s ready to do whatever it takes to defend herself and her friends. Thank you for making a comment. We love to talk about books! To keep posted on everything going on with the Ndulgent Bloggers, FOLLOW us. And, of course, INDULGE in something TODAY. Share book reviews and ratings with Ndulgent, and even join a book club on Goodreads. Because we want to share the most indulgent reads with our followers, the Ndulgent Bloggers only post reviews of 3 chocolate-dipped strawberries or more. 3 chocolate-dipped strawberries. liked it... enjoyed reading it. 4 chocolate-dipped strawberries. liked it a lot... will recommend it to others. 5 chocolate-dipped strawberries. loved it... will rave about it. A true indulgence! Happy Humpday - Zola's Magic Touch! The Indulgent Bloggers are not professional editors (okay, some of us are but not in this capacity) or reviewers and do not necessarily possess literary degrees. We are simply a book club reading romance novels and sharing our opinions. Everything you read in our blog is simply that - our opinions. The Guilty Indulgence Book Club is accepting review copies of books from authors, publishers and other third party distributors. However, receiving these books from outside parties will have no bearing on our reviews. The Indulgent Bloggers value integrity above all else (even pretty toes) and are completely honest in our reviews of all books - whether our opinion is negative or positive. Just like all book lovers, the Ndulgent Bloggers love ARCs (Advanced Readers Copy). ARCs are NOT to be sold but are given out to reviewers before a book release. Sometimes people will still try to sell these books, and normally for lots of money. It is illegal to sell ARCs! If you see anyone selling these books please report them. The Indulgent Bloggers believe in Respecting the ARCs Campaign.